Members of the Ontario Police Department would like to get to know you! 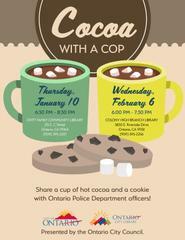 Join us for "Cocoa With A Cop" this Thursday, January 10, from 6:30 PM to 8:30 PM at the Ovitt Family Community Library. The library is located at 215 E. C Street. Kids and adults are welcome to attend.